ORCID number: Ting-Ting Li (0000-0001-9209-0602); Hao Liu (0000-0001-6131-9398); Jiang Yu (0000-0003-0086-1604); Guang-Yao Shi (0000-0002-2571-9252); Li-Ying Zhao (0000-0002-3723-5626); Guo-Xin Li (0000-0003-2773-7048). Author contributions: Li TT, Liu H and Yu J contributed equally to the design and preparation of this study and should be considered co-first authors; Yu J and Li GX designed the research; Li TT and Liu H contributed to data acquisition and writing of article; Zhao LY and Shi GY contributed to data analysis; Liu H, Yu J and Li GX contributed to editing, reviewing and final approval of article. Supported by the Guangdong Provincial Natural Science Foundation, No. 2016A030313843. Conflict-of-interest statement: Authors declare no conflict of interests for this article. Gastric cancer (GC), with its high incidence and mortality rates, is a highly fatal cancer that is common in East Asia particularly in China. Its recurrence and metastasis are the main causes of its poor prognosis. Circulating tumor cells (CTCs) or other blood biomarkers that are released into the circulating blood stream by tumors are thought to play a crucial role in the recurrence and metastasis of gastric cancer. Therefore, the detection of CTCs and other blood biomarkers has an important clinical significance; in fact, they can help predict the prognosis, assess the staging, monitor the therapeutic effects and determine the drug susceptibility. Recent research has identified many blood biomarkers in GC, such as various serum proteins, autoantibodies against tumor associated antigens, and cell-free DNAs. The analysis of CTCs and circulating cell-free tumor DNA (ctDNA) in the peripheral blood of patients with gastric cancer is called as liquid biopsy. These blood biomarkers provide the disease status for individuals and have clinical meaning. 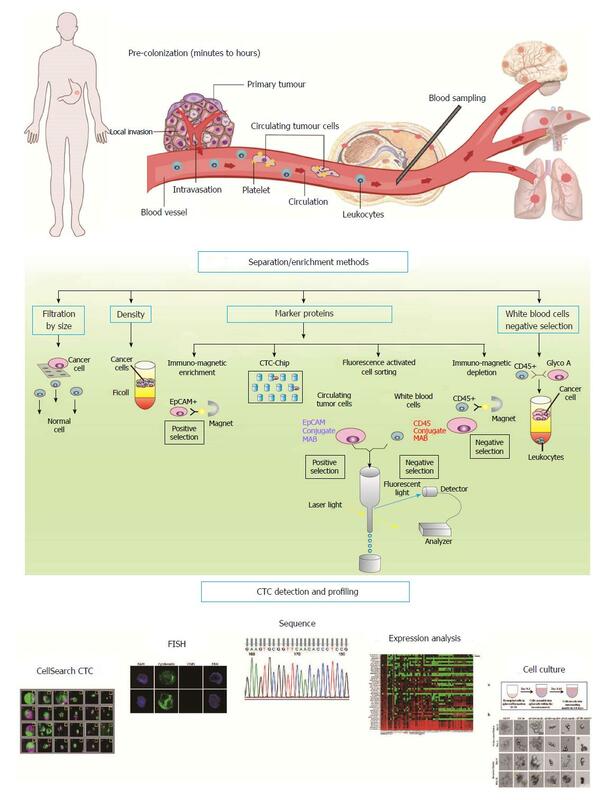 In this review, we focus on the recent scientific advances regarding CTCs and other blood biomarkers, and discuss their origins and clinical meaning. Core tip: As liquid biopsy, the detection of circulating tumor cells (CTCs) and other blood biomarkers have their certain clinical significance. In this review, we focus on the recent scientific advances of CTCs and some other blood biomarkers, and discuss their origin and clinical usefulness. Gastric cancer (GC) ranks as the fifth most common malignant tumor and the third leading cause of cancer deaths, with more than 951000 new cases and 723000 deaths estimated per year (GLOBOCAN 2012). Despite the development of diagnostic techniques, surgical techniques and perioperative management in recent years, the prognostic outcomes for GC remain poor. Because early stage GC tends to be asymptomatic and because mass screening is not popular, most patients in China are diagnosed at an advanced stage. The prognosis of peritoneal metastasis from gastric cancer is very poor. In addition, the median survival is 4-12 mo, and the 5-year actuarial survival rate of patients with peritoneal metastasis is less than 5%[3,4]. Therefore, finding useful diagnostic and monitoring tools for gastric cancer patients should be considered as the most important clinical objectives. A “liquid biopsy” for gastric cancer patients is used to detect physiological indicators or parameters in the serum; the procedure is less invasive than an endoscopic or surgical biopsy, and it allows practitioners to detect the disease earlier and visualize the dynamics and development of gastric tumors, as well as treatment efficiency and chemotherapy resistance. Carcinoembryonic antigen (CEA), cancer antigen 19-9 (CA19-9) and cancer antigen 72-4 (CA72-4) are regarded as clinically popular gastrointestinal tumor biomarkers. However, their positivity rates are less than 40% in GC patients, and the sensitivity and specificity of these blood biomarkers are not sufficient[5,6]. Indeed, if a blood biomarker is to be used in a population-based screening program, it should be reliable in repeated applications and easily measurable in blood serum or plasma by common laboratory equipment. Moreover, it should be present in the bloodstream before the onset of manifestations and clinical symptoms, be able to distinguish between cancer and inflammation and have high positive predictive value for malignant tumors. Therefore, there is an urgent need to identify more precise and effective blood biomarkers to provide optimal management for GC patients; these blood biomarkers should be able to provide early detection, clinical staging, therapy response monitoring, and prognosis for GC. Cells can be released into the blood stream from the original tumor and/or corresponding distant metastatic sites. These circulating tumor cells (CTCs) could be collected and detected through respective technologies according to their physical and biologic features. CTCs from cancer patients may be considered as a type of real-time “liquid biopsy” that could provide real-time information about the cancer status. CTCs have already been accepted by the FDA as a prognostic biomarker for monitoring patients with breast, prostate and colorectal cancer. Currently, the concept of “liquid biopsy” has also been accepted for the clinical application of evaluating ctDNAs that apoptotic and necrotic cancer cells discharge into the blood circulation. As we know, there are numerous genetic and epigenetic aberrations that could activate oncogenes and promote tumor progression. Therefore, we have developed sensitive molecular assays for the detection of ctDNAs in the blood plasma to find tumor-specific aberrations. Moreover, several autoantibodies against specific tumor associated antigens (TAAs) that are expressed by cancer cells and can be detected in the blood plasma more than five years prior to diagnosis have already been identified. Therefore, CTC, ctDNAs and autoantibodies could become potential blood biomarkers for gastric cancer. In this article, we focus on the clinical applications of CTC, ctDNAs and autoantibodies after a brief introduction of the biology and detection technologies, and we explore the future prospects of blood biomarkers in gastric cancer patients. The cancer cells that are released from the original tumor or corresponding distant metastatic sites into the circulating blood are called CTCs. However, these epithelial tumor cells cannot stay in the harsh conditions of the bloodstream, and it is possible that CTCs are selected through these harsh conditions. This proposal is consistent with the phenomenon that there are many apoptotic or fragmented CTCs in the peripheral blood stream of cancer patients. The treacherous journey through the vasculature is necessary for the spread of cancer cells to additional sites. CTCs are closely associated with activated platelets and macrophages. Moreover, the transference of metastatic cancer cells into the circulating blood often relies on various chemokines, such as CCR4, CCR7, CCR9, and CXCR4, which guide the cancer cells across the blood vessels. Even a few months or years after primary tumor removal, CTCs can be detected in the peripheral bloodstream of cancer patients, which indicates that cancer cells can be released into the circulation from other metastatic sites[15,16]. However, how these CTCs give rise to tumor metastasis and progression remains unclear. Future comparative genomic analyses of primary carcinoma and metastatic specimens along with CTCs from the same patient might provide more insight (Figure 1). Figure 1 Flow chart of current and potential applications of circulating tumor cell. Circulating tumor cells (CTCs): The blood samples from cancer patients are processed through various isolation/enrichment and detection techniques. CTCs are usually captured along with contaminating leukocytes. Various detection methods are utilized to detect the rare cell population in the bloodstream. Currently, CTCs are often detected by epithelial markers such as epithelial cell adhesion molecule (EpCAM) and cytokeratins (CKs), which are not expressed on the surface of blood cells and distinguish CTCs from the masses of blood cells. Epithelial cancer cells can make an epithelial-to-mesenchymal transition (EMT) that leads to decreased epithelial marker expression and enhanced plasticity and migration and invasion capacity. The CTCs that undergo EMT could be resistant to anoikis, which are necessary for the survival and dissemination of CTCs. It has been previously indicated that EMT might particularly affect the stemness of tumor cells. CTCs that undergo EMT might escape detection by EpCAM-based collection methods, such as the CellSearch system. Our previous study explored mesenchymal markers (Vimentin and Twist) to identify the mesenchymal phenotypes of CTCs in the bloodstream and their relevance to therapy responses. The evolution of various technologies to enrich and detect CTCs has been considerable, even resulting in the detection and verification of new CTC markers. It is vital that we pay close attention to the biological characteristics of tumor cells dissemination and potential stem cell like properties that are affected by EMT, particularly in the field of CTCs. Therefore, many companies have optimized their devices to select and detect CTCs that have undergone EMT. After an enrichment step, we could greatly increase the concentration of CTCs and enable the easy detection of even a single tumor cell. Then, CTCs can be detected by different techniques. In theory, CTCs could be positively or negatively chosen based on physical features (e.g., size, density, deforming character, and electric charges) and biologic features (e.g., the expression of protein markers). The enrichment of positively or negatively chosen CTCs could also be achieved based on particular combinations of physical and biologic features in a device. Then, the CTCs could be detected through immunologic, molecular, and/or functional assays. Recently, increasing numbers of research teams have attempted functional tests using cultures and xenografts of CTCs[20,21]. In vitro and in vivo CTCs models can be applied to detect individualized drug susceptibility. However, the ability to establish CTCs cultures and xenografts of CTCs should be improved to design personalized medicine. Currently, hundreds or thousands of CTCs are required to construct cancer cell cultures or xenografts, which limits this approach to individual therapy (Figure 1). The new technical developments that we focus on are based on new discoveries in CTC biology. A lack of knowledge has hindered the development of the application of CTCs for clinical diagnosis. However, new significant perspectives regarding the biological meaning of CTCs and various revolutionary techniques have been reported. We believe that equipment for the combined collection, detection, and characterization of CTCs will soon be applied clinically. Recurrence and metastasis not only predict clinical outcomes but also affect the quality of life of GC patients. They are the most critical factors in the treatment of GC. It was originally thought that incomplete surgical resection resulted in recurrence and metastasis after the operative treatment of GC; therefore, extensive radical resection was applied. However, this procedure was not successful, indicating that there are other possible reasons for recurrence and metastasis. Some researchers found that tumor cells could be released into the bloodstream at the early stage of solid tumors (e.g., breast, colon, lung, and gastric cancer). Therefore, CTCs may also play a vital role in monitoring the dissemination of gastric cancer and guiding the treatment of GC patients with recurrence and metastasis. As summarized in Table 1, many studies have reported the clinical value of CTCs as prognostic indicators by different detection methods, including the CellSearch system, RT-PCR/qRT-PCR, and FISH. Uenosono et al detected CTCs using the CellSearch system in 251 gastric cancer patients and found that the overall survival (OS) was obviously lower in patients with CTCs than in patients without CTCs (P < 0.0001). Subgroup analysis revealed that the relapse-free survival and OS were significantly lower in patients with CTCs than in patients without CTCs in the resection group (P < 0.0001). In a prospective study, Matsusaka et al also assessed the correlation between CTCs detected by the CellSearch system and chemotherapy and clinical outcomes. They found that GC patients with at least 4 CTCs at 2 and 4 wk after the onset of chemotherapy had an obviously shorter overall survival and progression-free survival than the patients with less than 4 CTCs. However, the CTCs levels at baseline (i.e., before chemotherapy) had no positive correlation with the clinical outcomes. These findings may indicate that the treatment response of CTCs is correlated with clinical outcomes. The number of studies using RT-PCR/qRT-PCR methods is relatively small. However, Mimori et al detected a candidate marker, the membrane type 1 matrix metalloproteinase (MT1-MMP) mRNA level, in more than 800 GC patients. This marker was chosen based on the results of a cDNA microarray analysis, and its correlation with prognosis was subsequently validated using qRT-PCR. As a consequence, the MT1-MMP mRNA level in the peripheral blood may be an independent prognostic indicator of recurrence and metastasis in GC patients (P = 0.0018). Table 1 Prognostic value of circulating tumor cells in gastric cancer. Characteristic and number of patients Detection method Statistic value Ref. qRT-PCR: Quantitative real-time polymerase chain reaction; MAH: Membrane-array hybridization; DFS: Disease-free survival; OS: Overall survival; PFS: Progression-free survival; RFS: Relapse-free survival. Taken together, these studies indicate that CTCs result in GC recurrence and metastasis and may act as vital therapeutic targets for the treatment of GC recurrence and metastasis after radical resection. Tumor DNA can be released into the blood stream from the primary tumors, circulating tumor cells, or metastases of cancer patients. The majority of circulating cell-free tumor DNAs (ctDNAs) come from apoptotic or necrotic cancer cells that release fragmented DNA into the circulating blood. Dying nonmalignant host cells can also release cell-free DNAs (cfDNAs) into the circulating blood. These normal cfDNAs can dilute the ctDNAs concentrations in cancer patients, particularly in circumstances when tissue-damaging procedures, including surgery, chemotherapy, or radiotherapy, were carried out. Even though the length of DNA fragments might provide some information about the derivation of cfDNAs[26,27], we should further explore the biological features of the ctDNAs in the circulating blood. Several studies have indicated that ctDNAs can even be absorbed by host cells, and this uptake can affect the biology of these host cells[28,29]. Thus, ctDNAs may be indicated as a new target for anti-tumor treatment in order to dilute this type of oncogenic DNA, an idea proposed decades ago. Several clinical applications of ctDNAs have been used for gastric cancer. ctDNAs is not only a tool for the early detection of cancer but also a prognostic or predictive factor (Table 2). Table 2 Detection of cell-free tumor DNA in gastric cancer. Candidate biomarkers Sample size Sample type Method/technology Diagnostic value/outcome Ref. AUC: Area under the curve; GC: Gastric cancer; GPL: Gastric precancerous lesions; HC: Healthy controls; MeDIP: Methylated DNA immunoprecipitation; MSP: Methylation-specific PCR; MSRED-qPCR: Methylation-sensitive restriction enzyme digestion and real-time quantitative PCR; Sn: Sensitivity; Sp: Specificity; FISH: Fluorescence in situ hybridization. Among previous studies of ctDNAs in GC patients, we found that some studies focused on the concentration of ctDNAs. In these studies, the housekeeping gene, beta-actin, and a non-coding DNA sequence, ALU, were assessed. By comparison, the most widely used method for detecting ctDNAs is the measurement of methylated DNA in the plasma or serum; this measurement is often performed with methylation specific-PCR (MSP) or quantitative methylation specific-PCR (qMSP) assays. With the advances in technology and verification of more sensitive and specific genes, evidence has accumulated in this field. Comprehensive analyses using methylation CpG island microarray have indicated the possibility of more meaningful genes for measuring methylated DNA. Furthermore, Ling et al have shown the effective application of methylated XAF1 DNA. This DNA could be used as a diagnostic or prognostic biomarker with high specificity and sensitivity. In addition to mutation analyses, gene amplification appears to provide relevant blood biomarkers. Park et al found that the combination of plasma HER2 and MYC concentrations to diagnose GC had a sensitivity and specificity of 69% and 92%, respectively. To determine the effect of sequencing methods upon the overall diagnostic accuracy, Shoda et al compared qPCR and digital droplet PCR (ddPCR) for detecting the HER2 amplification ratio in 60 patients with GC. A correlation between the plasma and tissue HER2 amplification ratios was observed by ddPCR (ρ = 0.424, 95%CI: 0.125-0.652, P = 0.00721). IgG Autoantibodies against specific tumor associated antigens (TAAs) can be detected in the blood more than five years prior to a clinical diagnosis of cancer, thus indicating their important role in the prognosis of early-stage cancer[37,38]. Additionally, autoantibodies have other promising biomarker qualities: they can be detected in every type of tumor that has ever been tested[39,40] and they are very stable and have antigen specificity. Assessing the autoantibody response against TAAs with multiplex immunoassays is supposed to be viable, and this method might make them clinically applicable. To the best of our knowledge, ten studies have reported the clinical diagnosis values of diverse GC associated autoantibodies or their combinations (Table 3). In these studies, the recognized biomarkers can distinguish GC patients from healthy controls with comparatively excellent specificity (87%-100%), but discrepant sensitivity (19.3%-98.9%). There are three studies that described the AUC: Zhou et al reported that autoantibodies against seven TAAs could distinguish GC patients from healthy subjects with an AUC of 0.73. Zayakin et al showed that 45 autoantibodies could distinguish GC patients from healthy subjects with an AUC of 0.79, while Meistere et al reported an AUC of 0.60. These ten studies of autoantibodies in GC vary greatly regarding the number of autoantibodies measured (ranging from 2 to 102), the techniques used to detect the autoantibodies, the definition of suitable control groups, and the methods used to normalize the data and define cut-off values. Taken together, these factors may greatly hinder the clinical application of the reported biomarkers. Table 3 Detection of autoantibodies against tumor associated antigens in gastric cancer. Biomarker signature description Technology Study design Sample size (GC/controls) Diagnostic value Ref. AUC: Area under the curve; GC: Gastric cancer; HC: Healthy controls; ND: Not determined; Sn: Sensitivity; Sp: Specificity; TAA: Tumor associated antigen; TSA: Tumor specific antigen; T: Training; V: Validation. In general, measuring autoantibodies against TAAs has been reported to have excellent specificity but general sensitivity, which would hamper its use in clinical medicine. The biological mechanisms underlying the limitations of autoantibody sensitivity are currently unknown. Additionally, the heterogeneity of TAAs among cancer patients is very high, and one cancer-specific autoantibody usually has a low probability of detection and is thus unlikely to have statistical significance. Therefore, recently published studies are likely to be statistically inefficient. However, diagnostic biomarker panels result in the low repeatability of initial results and reduce the diagnostic value of autoantibodies, but this issue could be remedied by analyzing combinations with good statistical significance. In general, the field of CTCs, ctDNAs and autoantibodies is stimulating discovery regarding the tumor recurrence and metastasis, but it is still in the early stages. The transformation of these blood biomarkers into conventional clinical indicators is hampered by the absence of consistency among different technical methods. The CellSearch system is the first standardized semi-automatic technique approved by the FDA to enrich and detect CTCs in patients with breast, prostate or colorectal cancer. Many studies have shown that the results of CTCs detection with the CellSearch system could serve as a clinical prognostic and therapeutic effectiveness indicator for these cancers. Recently, a few studies have shown that detection of CTCs in GC patients using the CellSearch system could be used for staging, predicting patients’ overall survival and evaluating the treatment effectiveness. However, large-scale clinical studies are needed to further validate the important role of CTCs and to explore an applicable cut-off value for the CTCs score in GC patients. Although various methods and techniques have been recommended for ultimately establishing an applicable, sensitive and real-time monitoring system using circulating blood, few methods can currently be applied in clinical practice. Large-scale clinical trials and further exploration of the biology and significance of blood biomarkers might solve the associated problems and improve their application as blood biomarkers. Therefore, the exploration of revolutionary blood biomarkers, such as CTCs, ctDNAs and autoantibodies, could provide many advantages for gastric cancer patients and improve their clinical outcomes in the future.